The tour lasts approximately 90 minutes. 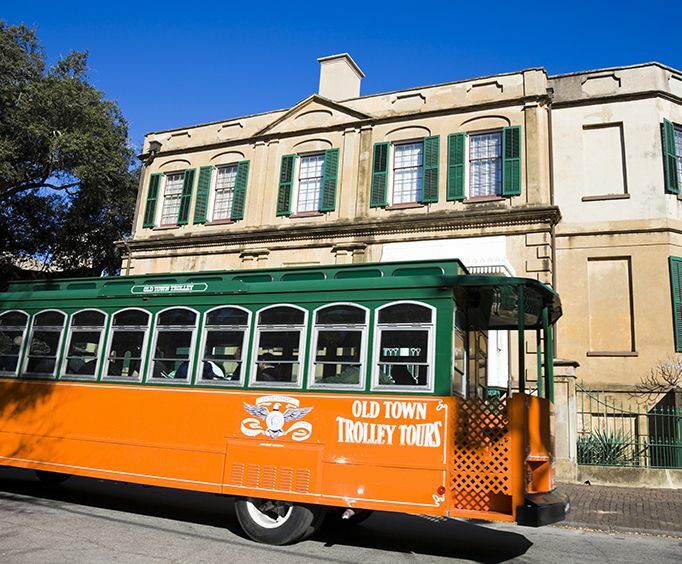 With this Savannah Narrated Trolley Tour, you can enjoy and appreciate Savannah's charm and hospitality while enjoy a full day of hop-on hop-off capabilities. Sit back in your seat admiring the immaculate southern homes and Spanish moss-lined avenues while a guide explains the history, culture, and famous stories of Georgia's first city. Learn the history, legend, and lore which has shaped Savannah into a unique place that is known both as one of the most romantic and most haunted cities in America. 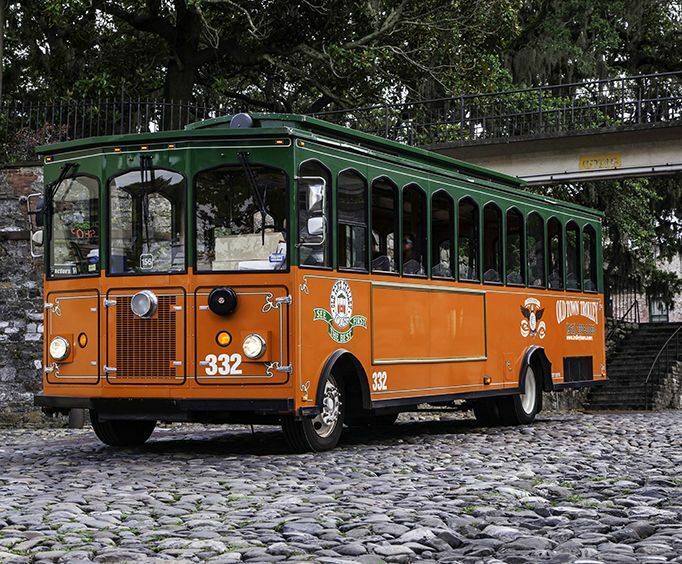 These orange and green trolleys have been circling the streets of Savannah for over 25 years, so guests can be sure that they're hitting all the hotspots of the area when you explore places like Forsyth Park, River Street, the Cathedral of St&period; John the Baptist, and so much more! Housed inside a historic Central of Georgia Railway Passenger Station, the Savannah Visitors Center is the place to go to learn all about Georgia's first city. You'll receive a friendly greeting and have access to info, tour maps, brochures, and refreshments. On this tour stop, also check out the Savannah History Museum, Savannah Civic Center, Roundhouse Railroad Museum, Battlefield Park, and Ralph Mark Gilbert Civil Rights Museum, some of which have admission fees. In the spirit of old Savannah, the historic City Market is alive and bustling, welcoming guests of all ages to enjoy its charming ambiance. Though the original structures did not survive, a group of history enthusiasts worked to revive the City Market, and due to their efforts, it is once again a center of activity. Today, visitors and residents come for the restaurants, pubs, unique shops, museums and galleries. While you're there, check out the Telfair Museum of Art, Trolley Stop Gifts, and Jepson Center for the Arts. From its beginning, Forsyth Park has attracted locals and visitors for its unique blend of natural beauty, history, and attractions. As the largest and oldest park in Savannah, it spans 30 acres and offers guests with beautiful ambiance, plenty of room for activities and sports, and has more than its share of historical intrigue. In the park, you can enjoy the Forsyth Fountain as well as the Confederate and Spanish-American War Memorials. Nearby, you can explore the Georgia Historical Society and the edge of the Victorian District. Now a museum, Massie School opened in 1856 as Savannah's first free public school and was closed as a regular school in 1974. Massie reopened in 1977 as a teaching museum for history and architecture, serving over 20,000 visitors last year. Now, the site hosts exhibitions and programs throughout the year. At this tour stop, you should also take a look at the Mercer House, Clary's Cafe, and Wesley Monumental United Methodist Church. 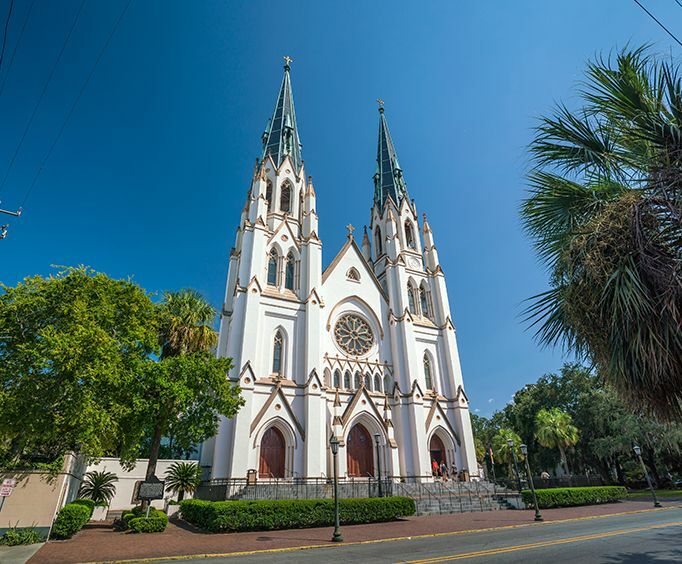 A glorious Savannah attraction to behold, the Cathedral of St&period; John the Baptist is an architectural masterpiece and the seat of the diocese of Savannah. In the French-Gothic style, pointed arches and magnificent details make a breathtaking backdrop to the gorgeous Savannah skyline. Also, check out the nearby attractions of the Flannery O'Connor House, Andrew Low House, and the south entrance of the Colonial Park Cemetery. Step into The Pirates' House for a taste of what Savannah was like in the mid-1700s. This inn, just steps away from the Savannah River, served as a watering-hole for pirates and seamen from the Seven Seas. Today, it is a specialty restaurant featuring authentic Georgia cuisine served in a theme reminiscent of its early roots. In the area, you'll also find the Marriott Riverfront, International Seaman's House, Chatham Artillery Monument, Vietnam Veterans Memorial, Celtic Cross Monument, and Emmet Park. Popular with locals and visitors, East River Street is an integral part of the historic Savannah Waterfront. From eateries to fine dining, art galleries and boutiques, there's something appealing for every taste. Make sure to check out shops like Savannah's Candy Kitchen, Bob's Your Uncle, The Peanut Shop, and The Shrimp Factory. Named after Henry Ellis the second Royal Governor of the Georgia colony, Ellis Square has been recently restored to its beautiful condition now. Featuring open spaces for public concerts and an underground parking garage, the park is also home to a bronze statue of singer-songwriter Johnny Mercer. Nearby, you can visit the Inn at Ellis Square, The Lady & Sons Restaurant owned by Paula Deen and her two sons, and First African Baptist Church. Trolleys arrive at each stop approximately every 20 minutes, and guests will have access to trolleys from 9 A&period;m. to 5 p&period;m&period; During the extended hours from April through July, trolleys continue until 6 p&period;m&period; With this tour, there are over 100 points of interest along the route, including 15 exclusive stops. Guests will also receive a coupon book to the area's restaurants and attractions. "The trip was so much fun." The trip was so much fun. We did not realize that you could actually step off the trolley at various sights throughout the day and take advantage of walking through many parts of savannah. The plans we made did not allow us time to do this, however, when we return we will take advantage of the on and off stops. We had several drivers , all pleasant. Beautiful town with lots of history. We live sixty miles from savannah and have been on this tour twice. Great family fun! The trolley tour was good because we got to cover more ground and got more history about savannah. It was great because you can get off the trolley at any of the stops and explore the area more then jump back on another trolley and finish the tour. The trolley experience was so much fun. We enjoyed the hopping off and on. This trolley does not pick up from the hotel we stayed in. We had to drive to the place.